Hopi Snake Dance. Click for prints, downloads and products. 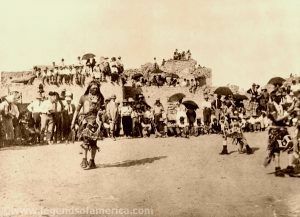 The most widely publicized of Hopi rituals was the Snake Dance, held annually in late August, during which the performers dance with live snakes in their mouths. The dance is thought to have originated as a water ceremony because snakes were the traditional guardians of springs. Today, it is primarily a rain ceremony and to honor Hopi ancestors. The tribe regards snakes as their “brothers” and rely on them to carry their prayers for rain to the gods and spirits of their ancestors. The Snake Dance requires two weeks of ritual preparation, during which time the snakes are gathered and watched over by children until time for the dance. On the last day of the 16-day celebration, the dance is performed. By percentage of the local snake population, most are rattlesnakes, but all are handled freely. Before the dance begins the participants take an emetic (probably a sedative herb) which is not an anti-venom and then dance with the snakes in their mouths. There is usually an Antelope Priest in attendance who helps with the dance, sometimes stroking the snakes with a feather or supporting their weight. The dance includes swaying, rattles, a guttural chant and circling of the plaza with snakes. After the dance, the snakes are released in the four directions to carry the prayers of the dancers. Although part of the Snake Dance is performed for the tribe, this is only a portion of a lengthy ceremony, most of which is conducted privately in kivas. Though the dance was once open to the public, it is now open to only tribal members due to illegal photography and a lack of respect for the traditions and ceremonial practices of the Hopi. Chief Turtle, Rain Dance in Montana., Bain News Service, 1920. Click for prints, downloads and products. This ceremonial dance is performed by numerous agricultural peoples, especially in the southwest, where summers can be extremely dry. The ceremony was performed to ask the spirits or gods to send rain for the tribes ‘ crops. The dance usually takes place during the spring planting season and before crops are harvested. However, it was also performed in times when rain was desperately needed. One thing that makes rain dances unique from some other ceremonial dances is that both men and women participate in the ceremony. The dance varies from tribe to tribe, each having their own unique rituals and costumes. Some tribes wear large headdresses while others wear masks. Accessories often include paint on the body, beads, animal skins, horse and goat hair, feathers, embroidered aprons, and jewelry made of leather, silver, and turquoise. Feathers and the color blue are often found in dress and accessories, symbolizing the wind and rain, respectively. These special clothes and accessories which were worn during the rain dance were generally not worn at other times of the year, but rather, were stored for this specific ceremony. Dance steps usually involve moving in a zigzag pattern as opposed to other ceremonial dances that involve standing in a circle. Stories of the origins of ceremonial dances have been passed from generation to generation orally. When the Native Americans were relocated in the 19th century, the United States government banned certain tribal ceremonial dances. In some regions, tribal members would tell federal authorities that they were performing a “rain dance” rather than disclosing the fact they were actually performing one of the banned ceremonies. Though the rain dance was most often performed by tribes in the southwest such as the Puebloan, Hopi, Zuni, and Apache, other tribes also performed the ceremony, including the Cherokee in the Southeastern United States. Many tribes continue to perform this ceremony today. Creek Stomp Dance, courtesy National Park Service. Performed by various Eastern Woodland tribes including the Muscogee Creek, Yuchi, Cherokee, Chickasaw, Choctaw, Caddo, Delaware, Miami, Ottawa, Peoria, Shawnee, Seminole, Natchez, and Seneca–Cayuga, the Stomp Dance is a ceremony that contains both religious and social meaning. The term “Stomp Dance” is an English term, which refers to the “shuffle and stomp” movements of the dance. In the native Muskogee language, the dance is called Opvnkv Haco, which can mean “drunken,” “crazy,” or “inspirited” dance, referring to the effect the medicine and dance have on the participants. 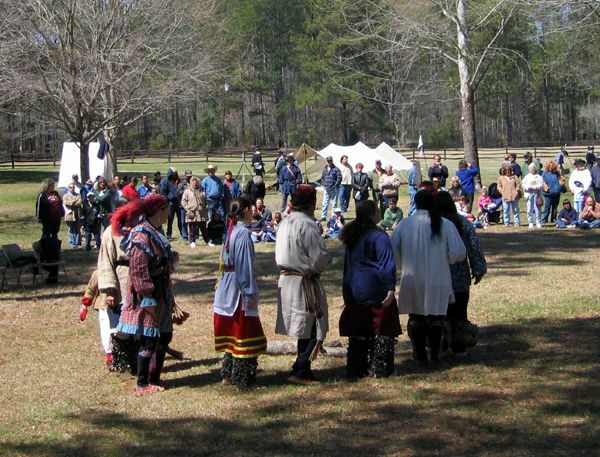 A nighttime event, the dance is affiliated with the Green Corn Ceremony by the Muscogee Creek, Cherokee, and other Southeastern Indians. These dances are generally performed several times during the summer months to ensure the community’s well being. Performed by both men and women, these events may include some 30 or more performances, each sung by a different leader and may also include other dances such as the Duck Dance, Friendship Dance, or the Bean Dance. When a leader begins, he circles the sacred fire and is followed in single file by those who wish to participate. Leading the dancers counter-clockwise around the fire, participants sing, shake leg rattles, and dance in a stomping step. Men and women alternate positions behind the leader, organizing themselves by age and skill, with the youngest and least experienced dancers at the end of the line. Dancing typically starts well after dark and continues until the dawn of the next day. Participants who are making a religious commitment will begin fasting after midnight and are obligated to stay awake the whole night. The “medicine” taken by participants is made from roots and plants which have been ceremonially gathered and prepared by a Healer. Dancing continues until the sun rises, at which point the event is concluded. The Sun Dance is practiced primarily by tribes in the Upper Plains and Rocky Mountain areas. This annual ceremony is typically performed at the summer solstice, with preparations beginning up to a year before the ceremony. Though the dance is practiced differently by different tribes, the Eagle serves as a central symbol in the dance, helping bring body and spirit together in harmony, as does the buffalo, for its essential role in Plains Indian food, clothing, and shelter. Many of the ceremonies have features in common, such as specific dances and songs passed down through many generations, the use of a traditional drum, praying with the pipe, offerings, fasting, and in some cases the ceremonial piercing of the skin. Although not all sun dance ceremonies include dancers being ritually pierced, the object of the sun dance is to offer personal sacrifice as a prayer for the benefit of one’s family and community. In the late 1800s, the U.S. government made an attempt to suppress the Sun Dance. The Cheyenne ceremony “went underground” and reemerged in the twentieth century. In August, 1890 the Kiowa Sun Dance was disrupted by rumors of army patrols and the dance abandoned. However, in September of that year the first Ghost Dance was held, and for many years it took the place of the Sun Dance. The last Ponca sun dance was held in 1908. The policy of government suppression ended with the issuance of the 1934 circular Indian Religious Freedom and Indian Culture, and since then Sun Dances intermittently have continued to be held. 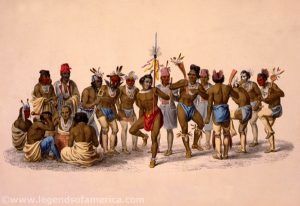 War dance of the Sauk and Fox, Peter Rindisbacher, about 1830. Click for prints, downloads and products. Many tribes practiced a War Dance on the evening before an attack to observe certain religious rites to ensure success. The warriors took part in a war dance while contemplating retaliation and the dance stirred emotions and filled the braves with a profound sense of purpose as they prepared for battle. Though the ceremonies varied from one tribe to another, there are common points among many including singing, often extending over an entire day and night, interspersed with prayers, handling of sacred objects or bundles, and occasional dancing. Often a sweat lodge or other purification ceremony was also held, incense burned, faces might be painted, and a pipe was frequently passed between the participants. Generally, the only musical instruments used in these ceremonies are rattles, drums, and whistles. In the Pacific Northwest, the Pueblos of the Southwest, and the Iroquois of the Woodlands, participants often were dressed and masked to represent the various gods or supernatural creatures and who acted out parts of the ritual. 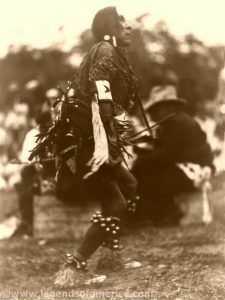 War Dance names vary among Indian communities, with the Fancy Dance incorporating war dance rituals of he Kiowa, Cheyenne, Arapaho, Comanche, and Kiowa – Apache tribes. To the Shoshone and Arapaho tribes, the wolf is symbolically linked to a warrior and the ritual is called the “Wolf Dance.” The Lakota Sioux ‘ Omaha dance is named after the Omaha tribe, who taught the dance to the Lakota, and the war dance is known to Utah’s Paiute tribe as the Fancy Bustle, in reference to part of the dancer’s costume. Very interesting things I’m trying to learn the way of the native American because my mother was of 50% of native American I’d like to pratices these an teach them to my childern.